Hi, I was wondering if you HAVE to have compost in your garden or can you just use soil and fertilizer? Depends on your soil. Most soils need some extra organic material added to improve the soil quality. How much clay do you have, how fast does it drains, and what nutrients are in it(from a soil test) make up the factors in answering your question. 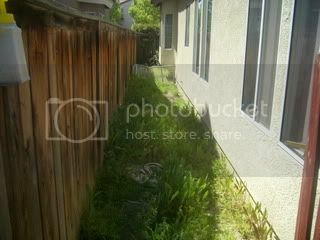 Changes in your yards environment since your house was built change your soil. The best soil is on the forest floor, where leaves drop every year, naturally compost, and keep the soil rich. Remove trees, and remove a large source of nutrition for your yard. That's where compost comes into play, replacing the nutrients. Well obviously you can grow things with just soil and fertilizer, most American farmers do. That's where almost all the veggies in the stores come from. It depends on what you want. If you want to grow a big mono crop with the least effort possible, you use soil and chemical (ie inorganic) fertilizers. In the process, you break down the tilth (water holding capacity) of the soil, so you have to water more. You destroy the nitrogen fixing and other bacteria in the soil, so you have to keep adding more and more fertilizer, your soil tends to crust over, so then you have to till more, so then more of the earthworms and other soil biology are destroyed and your soil erodes more. The inorganic ferts are missing a lot of all the trace nutrients the plants need so the plants are not as healthy and can't fight off pests and diseases as well, so then you find yourself needing to buy chemical fungicides, insecticides, etc. Then you have killed off all the beneficial insects (and fungi) so you have to keep using the pesticides more, the honeybees all die so you have to hand pollinate .... in the end it turns out to be more cost and labor than working with nature. Some of the costs we are only just now beginning to understand... They are saying 2010 is shaping up to be a very bad year for colony collapse disorder (the disappearance of the honeybees). Using compost and mulch avoids all that, maintains the soil structure and tilth, improves water holding capacity, increases the nutrients in the soil, feeds the earthworms, bacteria, fungi, etc that feed your plants, maintains a beneficial ecosystem where the plants' own immune systems can function as can all the beneficial insects. My mother grew tomatoes (and supplied the neighborhood with them) in the same strip of ground along side the house for 20 years by only turning under the grass clipping mulch and adding fertilizer, she liked the osmocote time release stuff. Tomatoes produced well enough, the soil didn't turn to dust, and there was not even the hint of ecological disaster. Since that time I have added a lot of compost to that area so that I don't have to water as much, and I dug below the topsoil into the hard clay subsoil to give the roots more depth, adding compost helped turn that clay subsoil into topsoil. I do have a patch of garden where the soil is so good that I don't waste my compost on it yet. Too many other places need improving. Comparing teeth to soil,... adding compost is like brushing your teeth. Some teeth will rot out quickly if you don't take care of them while others will last a long time, but brushing is a good preventative measure in any case. hmm, well Im not going to have a big garden. I will post pictures of the area today. But the pictures are going to be before I have weeded the area and such. How do you start and maintain a compost pile? It can be as simple or elaborate as you want. I basically do cool composting. I just have my wire bin and I throw stuff in as it comes along, making sure to cover food scraps with a good layer of leaves and weeds and to keep some balance of layers of greens and browns (see Green & Brown sticky at the beginning of this forum for more on that). If it isn't raining very often, I water the pile when I water my garden. Every once in awhile I punch holes down through it with a stick, for air channels, but I don't bother turning it. In a few months, when I want to use some compost, I take all the unbroken-down stuff off the top and make it the bottom of a new pile, down to the level where the earthworms are. If that isn't quite finished, it gets stirred around a little, exposed to more air and very quickly finishes up. I don't work real hard at composting, but it works for me! 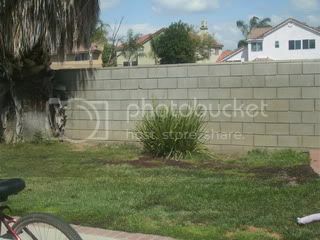 Here are some pictures of the area(s) I am going to be doing some gardening. 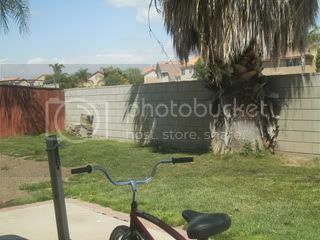 My dad is going to fill that dirt patch in with grass =( I tried convincing him to let me use it for my garden but he said no. I was doing some weeding in the dog run area and I noticed the dirty is awfully rocky. I don't think its plantable for vegatables. I know there are other ways to plant vegetables but what kind of soil would I need to use? And what would I need to buy to plant my vegetables in? Along about now, I'd start thinking about raised beds. Rocky soil will need to be sieved or de-rocked in some other way and then built up with compost/nutrients. By the time all that work is done, you could have already built, filled, and planted seeds/seedlings in raised beds. They don't have to be fancy. My Bed #1 is made from two courses of concrete blocks simply set on each other--no mortar--and filled with various composts, vermiculite, and peat (won't do that again...hydrophobic stuff that it is ). Its inside capacity is 4' x 8' x 14". There's a stepping stone in the middle. It took me, bad knees/hips, migraines, and all, one morning to haul the concrete blocks from the carport to the planned site, lay down the blocks, lay down the layers of newspaper on the bottom, and--yes--water the newspaper so it wouldn't blow away that day. When DH got home, we both mixed the composts, etc., on a large tarp (we stood upwind) and then shoveled it into the "box." should bring many to light. Yeah I was thinking about raised beds from the very beginning actually because I had a feeling the soil would be bad. I'll have to find some instructions or something on how to build a raised bed. I was going to suggest raised beds, too. But your dog run is between a tall solid fence and the building. How many hours of sunlight does that area get? It looks kind of shady. You also haven't said what part of the world/ zone/ climate you are gardening in. It makes a difference. In very hot sunny areas like TX and AZ plants benefit more from some protection from the sun, while here in hazy OH, the same plant will need a lot more hours of sunlight. But of your list above, the lettuce, spinach, peas, carrots, onions, broccoli, are cool weather plants, that don't like hot sun. In many areas of the country they can be planted now (mine are sprouted already). In the south it is too late for most of them, which would have been planted in Feb. They could be planted again in September-ish (depending on where you are) for a fall crop. But it also means that they are ones that tolerate shade better. The tomatoes, peppers, zucchini, cucumbers are warm weather, full sun crops. They don't get planted until the soil is warmed up a bit. But unless you are in TX or somewhere, they don't deal well with less than 6 hrs of sun a day. Depending on a variety of factors, they may survive there, but production will be very reduced. Another possibility would be to plant the tomatoes etc out in the back yard and do some flowers in the dog run. There are lots of beautiful part sun/ shade flowers! I am in Southern California close to the desert. How do I find out what zone I am in? I was rethinking the veggie garden in the dog run as I don't think it will be suitable to grow vegetables so I think I am going to build a raised bed that can go on concrete. I don't have a large backyard and my dad is weird about where I plant things *sigh* so I will have to figure out where to put it and discuss it with my dad. Ive always wanted to plant stuff in the dog run so it will probably be flowers back there instead. put your zip code in the box and it will tell you your zone. But as cynthia_h our moderator from Calif will tell you, along the West Coast the USDA zones are less useful. All it tells you is how cold it gets in winter, nothing about summer heat, coastal fog, etc. The Sunset Western Garden Book divides it into much more detailed areas and gives tons of information about plants, planting schedules etc for each area. It's available in libraries or older editions are available used cheap on Amazon. amyshizzle wrote: I am in Southern California close to the desert. How do I find out what zone I am in? Sunset's Western Garden Book has detailed maps of southern California, northern California, Oregon, Washington, ... all the western states and provinces, showing which Sunset climate zones they're in. The Los Angeles Basin alone accounts for seven Sunset climate Zones (#18 through #24). Sunset climate zones are based on average max/min temps, winds (direction and speed), precipitation, latitude, elevation...just a host of variables. Once you've ascertained your Sunset climate zone, you can look under the list of plants and their cultivars elsewhere in the Western Garden Book to see which cultivars are most recommended for your zone, and when it's recommended to plant them in your zone. Sunset was instrumental in helping me transition from four-seasons gardening in Atlanta to "Mediterranean" gardening in the Bay Area. The USDA Hardiness zones, which take into account only the minimum winter temperature and whether a plant will survive that temp, aren't very helpful when you're looking for what will succeed vs. what won't die. Annuals, esp., aren't expected to over-winter, but we do want them to succeed when we plant them! There's an online version of the Sunset climate zone maps, but I've looked at it, and a lot of the important detail, esp. around the Seattle/Puget Sound area and in southern California near the different mountain ranges, has been omitted completely in favor of simplicity. I can't recommend the online version. Most hardware/garden-supply stores/libraries have copies of Sunset. Take a look through it, at least to get your zone. I use the 7th ed., published in 2001; the 8th has now been released. I only purchase every other issue, so I'll wait for the 9th ed., whenever it shows up. Info doesn't change *that* quickly! I beat you by two minutes, cynthia! But you gave a lot better info! Pretty funny! I must have been writing it even as you were sending!